Last Thursday, my third period Algebra 1 seemed to need some more help with locating points on the coordinate plane so we used an activity suggested to me by a veteran math teacher. 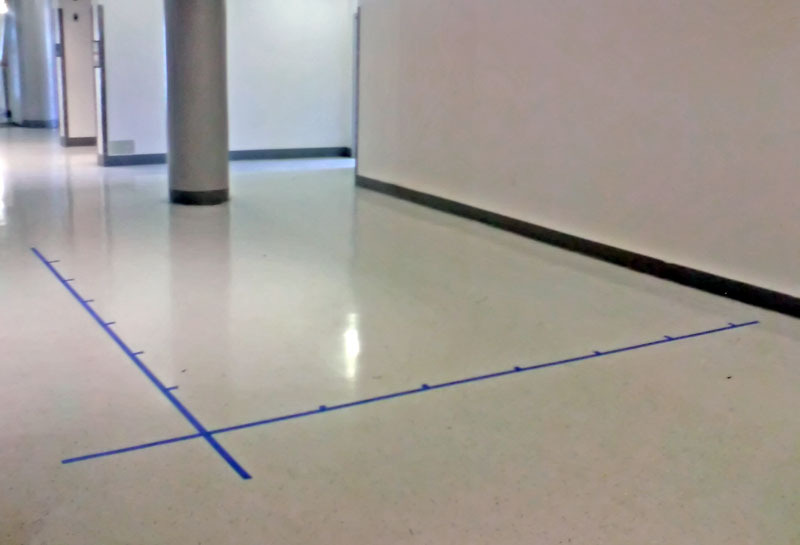 I used blue painters’ tape to mark off x- and y-axes, and took advantage of the tile floor in the school hallway. Each student was given one coordinate and the students were asked to stand at their coordinate. The activity revealed who understood how to locate a point on the coordinate plane using coordinates, and who did not. Some who did not know asked their friends, others stood on the side lines and I helped them find their spot. Next time, I need to be more careful not to “out” students who don’t understand a task. It involved making a large set of coordinates on the ground in the middle of class and dividing students into teams. One team is picked to start and (for algebra) an equation would be put up on the board. The team would have a limited amount of time to create the graph represented by the equation by arranging themselves either lying down or standing up. If the team couldn’t get the graph correct in the time allotted they would not get a point for that turn and the next team would get a chance to try, so on and so forth. I can imagine that in an algebra class particular emphasis would have to be put on having people cross the axes at the correct points and on getting approximate slopes correct; I also think that this is a game that you won’t be able to play for another few months at least. We always had a ton of fun playing this game in class when we got the chance and I think that your students might have a similar experience. If you would like more detailed rules I can e-mail my former teacher and ask him, but I’m sure that with these general guidelines and your understanding of game theory a fair game could be constructed. My only recommendation here is that you include the other quadrants, even if only in your original tape layout, so that you can repeat this activity when the time comes to use the negative coordinates. It’s way too early for Zach’s game, but it would be a good thing to see before the year ends. Equations like x + y = 5 and y = x^2 are often easier to do this way at first, since kids are responsible for just single points. Also, this is a nearly-impossible game to play with a giant class. 15 is good… 36? Ho boy.